There are different types of exercise machines, but we chose the Sunny Health & Fitness SF-T7604 Electric Treadmill for you because it works like it is advertised or mentioned in the review below. However, the main problem with products by Sunny Health and Fitness is the fact that the instructions are often complicated and users are unable to understand. A fitness machine such as a treadmill doesn’t require an introduction since we are all well aware of what this machine is. However, most of us don’t have an idea as to what is a good treadmill machine and how should you identify a good treadmill machine before purchasing it. Many users might end up purchasing a machine that is worthless or has some minor flaws. Here on Sweat on Fitness, you will see everything explained comprehensively and solution to some solvable problems. 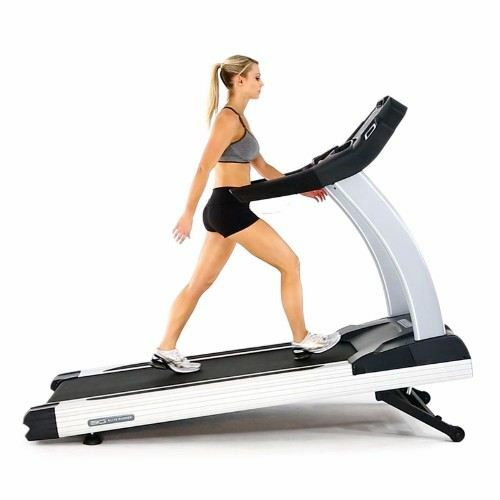 The Sunny Health & Fitness SF-T7604 Electric Treadmill is also one such treadmill. Find out more about it in the review below. The best thing about this Sunny Health & Fitness Electric Treadmill is the fact that it comes with a high horse power motor. This is basically a DC motor which has 2.5 horse power. In other words, it has enough power to run an 18 x 51-inch surface on optimal speeds. This means you will be easily having a workout on this fitness machine. Coming to the main thing, there are more than 15 preset programs in this electric machine with 3 manually adjustable levels of incline. You can have the workout customized according to your requirements and have an effective one. An exercise machine which provides you efficiency with the maximum comfort is going to be the best one. In the case of this machine, there is an easy folding mechanism with which you can have it folded in almost a minute. There are transportation wheels as well so that you can carry it around anywhere you wish to and store it as well. There is a large LCD display that basically displays various aspects regarding your workout including time, speed, distance, calories, and Pulse rate as well. There are controls too which cannot only be adjusted from the screen but can also be adjusted from the handrail. These include start – stop, speed change, and a measure of pulse. We believe that in such a case you should try the online tutorials or get the expert assembly by amazon.com to avoid any sort of inconvenience. Get it from amazon.com right now and enjoy your workouts.